Nearly 20% of women say that if forced to choose, they'd choose social media as the only platform to learn about popular cultural trends. As part of the POPSUGAR Insights Content, Commerce, and Culture study, we surveyed over 1,500 women between the ages of 18-44 and asked them to provide additional detail about the specific social platforms they rely on for info about trends in various categories. 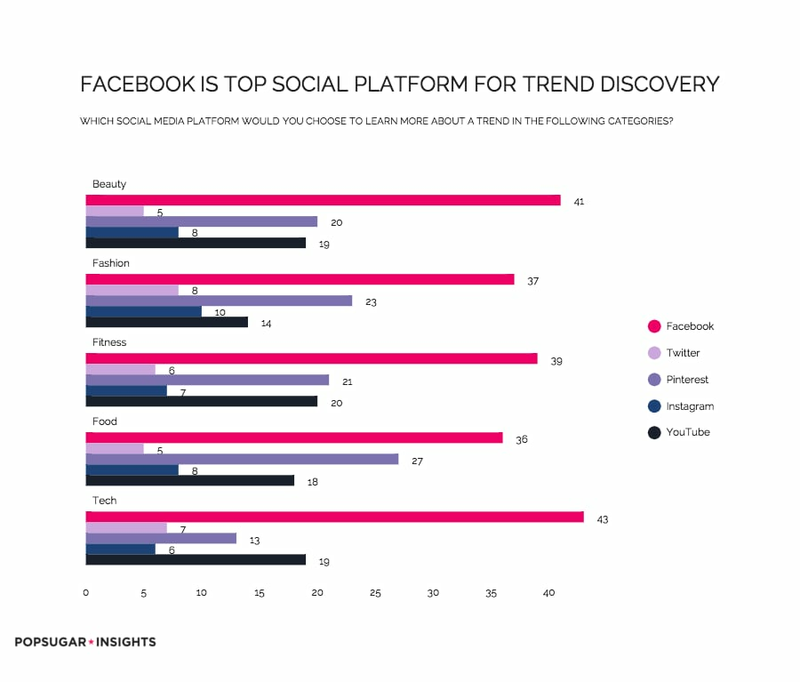 For beauty trends, Facebook is the number one platform, with 41% of women saying they rely on it for obtaining info related to beauty trends. Pinterest (20%) and YouTube (19%) rank second and third respectively. Following YouTube, Instagram ranks fourth with 8%. Fashion follows beauty with Facebook (38%) ranking first, followed by Pinterest (22%) and YouTube (14%). Instagram ranks higher for fashion, with 10% of women, and Twitter (8%) and Tumblr (4%) both ranking higher in fashion than they do in beauty. For fitness, Facebook is the choice of 39% of women, followed by Pinterest (21%) and YouTube (20%). Instagram again ranks fourth overall (7%), but in fitness, Twitter is a close fifth (6%). For food, Facebook again reigns supreme (36%), again followed by Pinterest (27%), YouTube (18%), and Instagram (8%). Twitter is a distant fifth (5%). Finally, in technology, Facebook once again ranks number one overall (43%) and with a higher percentage of women than in any other category. This time, YouTube (19%) takes the second spot, followed by Pinterest (13%), Google+ (7%), Twitter (7%), and Instagram (6%).